The system sprang to life. An Agent of the New Order brought content to Elonaya. The man in question was Mihai Albescu, one of countless Agents who do not belong to the CODE. alliance, but who nevertheless represent the New Order and its Code. "I decided to walk a day in James 315's shoes, using his time-tested method of bumping. I equipped a Stabber Fleet Issue and visited an ice belt in Elonaya system near Jita. The good news is that almost all of the miners were aware of the Code and were following the rules about tanking their ships and being present at their keyboards. The bad news is that not a single one of them had a permit in the bio." It's difficult to overstate the New Order's impact on highsec life. Even miners who refuse to embrace the Code are forced to obey many of its rules. 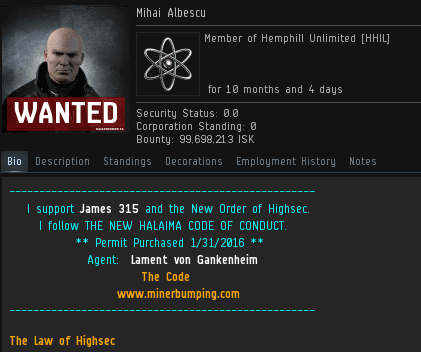 Every miner in highsec who remains at their keyboard, or who sacrifices yield in favor of tank, has had their gameplay directly influenced by the Code. Enaka Oriki > Mihai Albescu really? Mihai Albescu > Everybody just ganks nowadays, time to kick it old school. The spectacular killmails produced by gankers attract a lot of attention, and for good reason. Bumping remains an effective alternative, though. And it always takes the miners by surprise. One advantage that bumpers have over gankers is that they can spend a lot of quality time relaxing in the asteroid belts and ice anomalies. They get to know the miners well. 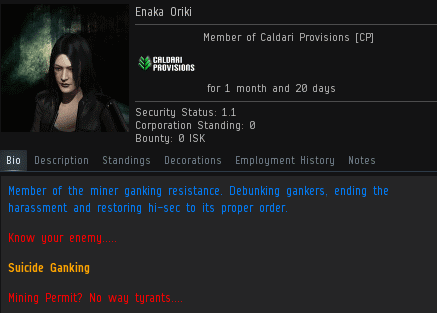 Agent Mihai swiftly identified Enaka Oriki as a rebel. Mihai Albescu > Member of the resistance? You've got your priorities messed up. Enaka Oriki > I do? Mihai Albescu > I'd heard bad things about this ice belt, and I'm afraid they all seem to be true. Not a permitholder among you. Mihai Albescu > Enaka Oriki Are you giving me the carebear stare? Enaka Oriki > wow what a way to waste my time. Ganks produce a sudden shock to the bot-aspirant's system. Bumping, on the other hand, is a more gradual means of persuasion. Its power only dawns on the miner slowly. Andrev en Tilavine > what did I miss? In rapid succession, Mihai bumped one miner after the next, producing a symphony of different reactions in local. Sarie Thiesant > its making me laugh... this guy is too funny. Sarie Thiesant > oh no look what i can do.... bump a ship. Sarie Thiesant > They only exist because ccp likes the content. Sarie Thiesant > Oh... Wait. He was perma band. Sarie Thiesant dropped a "Bumping? That won't do anything" before repeating the widespread rumor about me being permabanned from EVE. For some reason, that rumor has been circulated and recirculated since the earliest days of the New Order. Mihai Albescu > What's the perceived scam, friend? Andrev en Tilavine > CODE. at least has a mission; delusional, but a mission nonetheless. Mihai Albescu > Their vision is good. Looks at all these tanked ships. Not a retriever or hulk among them. Mihai Albescu > and every single one of them at their keyboard. Miner bumping is arguably the most elite PvP available in EVE. Unlike other PvP'ers, a bumper must manually navigate, aiming his ship with near-perfect timing and precision. It's also a psychological battle, a test of wills and endurance. Who will give up first, the bumper or the miner? Sarie Thiesant > i had to unload. Mihai Albescu > Sarie Thiesant Buy a mining permit or risk bumping. Sarie Thiesant > bump all you want. i'm busy with some better things. Mihai's faith in the Code won the day. One after the other, he removed all of the miners from the Elonaya ice anomaly. Sarie was the final miner to give up. She suddenly realized she had better things to do than get bumped out of mining range. Rebel miners ask what bumping can possibly do. The real question is, what can't it achieve? Sarie Thiesant > i was going to go to zzz, but now i just want to hang out. Mihai Albescu > Sounds good to me. It gives me a chance to clear up your misconception. Sarie Thiesant > Which one? Your harrassment? Your bullying? Bumping a miner puts them out of commission temporarily. They might stop mining for a few hours, or a day or two. To have a truly lasting impact--for the miner to be permabumped, you might say--they must be educated in the Code. Now that the mining had ceased, it was time for Agent Mihai to teach the Elonaya system. Everyone knows that I support ganking in all its forms. But I still remember the days when to be an Agent meant to be a bumper. James would call for a meetup and the entire New Order (all 20 or 30 of us) would jump across highsec to a new system, virgin territory to the New Order, and descend upon the unwary hundred or so miners sitting in the permanment ice fields. We would start bumping anything and everything, demanding permit purchases and praising James while the confused and startled miners would react in terror and anger. Then we would settle in for a few weeks stay... and then move somewhere else and do it all over again. Oh the anger, the tears, the disbelief. THIS COULD NOT BE LEGAL! Only it was as a fifty page thread on the forums finally attested to after much deliberation by CCP. As Mihai's story above shows, miners accept the fact that they can be ganked even if they hate it, but bumping still is beyond the pale. I never had a bot aspirant get as mad at me for taking his ship as they used to get at us for moving them out of their control. Good times. May they come again. Can we look forward to return of the beloved Miner Goal? The anchored cans through which detestable non-compliants were kicked screaming? That was truly hilarious. Sorry, it was a 30 page discussion. The original thread and the CCP decision thread combined was over 50 pages. The original is great reading for those interested in the early days of the New Order. I remember those New Order relocation events. Like the great Crusades we would move en mass through the galaxy on our way to the next selected region to be enforced, warning non compliant miners in local & announcing our mission as we went..
And here we have another Donald Trump supporter who has trouble distinguishing fantasy from reality.